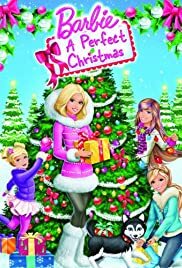 Rainmaker Toys With Mattel's "Barbie"
Barbie stars in her first holiday movie in this heart-warming adaptation of the classic Dickens story filled with cherished Christmas carols, fabulous fashions and lots of laughs! The storyline and message is passable but the voice acting leaves much to be desired and the singing is TERRIBLE. I understand that they wanted Barbie to be more "modern" so they had a casting change from the original woman who voiced Barbie. But if she is going to sing she should still have a gorgeous, stunning voice. The singing voice of Barbie (and every other character) is disappointing. The songs had so much potential but I can barely stand listening to these average voices. Especially considering the singing voice Barbie used to have (Kelly Sheridan). What a let down, I hope the producers take note. Barbie is supposed to be what everyone else deems as the perfect person...good at everything...except apparently singing. Sure, her voice is more raspy and "modern" now but being modern doesn't mean you need to sing like an amateur. And what's with the child's voice? She is what, 6 or 7? Why isn't a child of that age portraying her? The animation has also gone downhill since A Mermaid Tale and Fashion Fairy Tale. I hope this is a one time flub and Mermaid Tale 2 will bring back the awesomeness of the other films. And please, if she's going to do another film where she is singing, BRING BACK KELLY SHERIDAN. What you have done to Barbie is not awesome, cool, trendy or modern. You are making her boring, average, shallow and untalented.